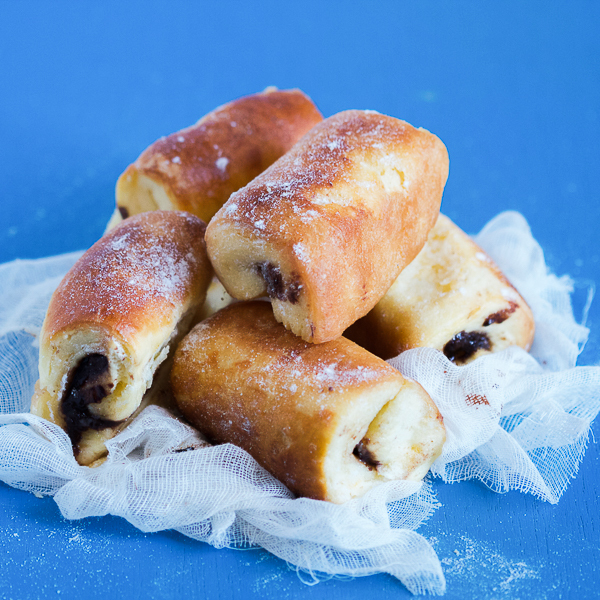 Say HELLO to your new favorite pastry: Nutella rolls! Warm, soft and comforting on the outside, smooth and chocolaty on the inside. This is what dreams are made of. Nutella has taken the world by storm in the past few years. Nowadays, everywhere you look there is a recipe for Nutella this or that. I’ll tell you a secret though… The idea behind Nutella isn’t new. As kids living in Europe, we’ve been eating our bread with chocolate for ages. In addition, seeing how crazy we were about the chocolate topping, our moms started coming up with different ways they could incorporate it into dishes. 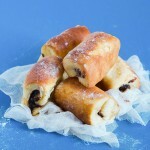 One of these recipes are “buhtle sa eurokremom,” or Nutella rolls for short. 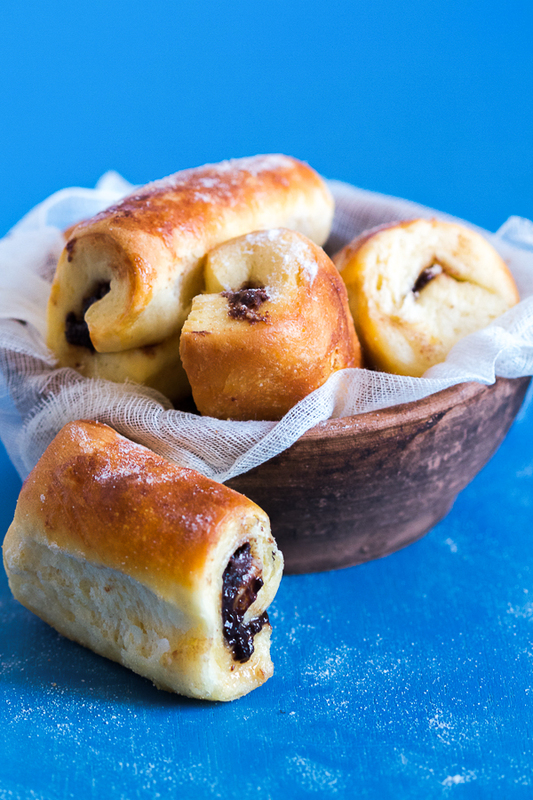 If you’ve made any type of rolls before, Nutella rolls won’t be new for you either. And if you haven’t, not to worry. As always I break it down below so you can follow the photos and make the exact same rolls. And the dough making process is the same for all dough-y things whether you’re making bread, or other types of pastries. 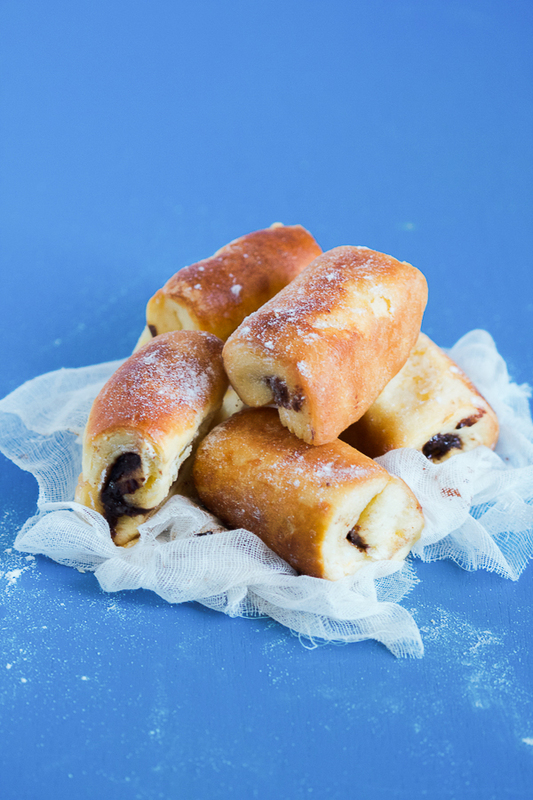 Nutella rolls are versatile. They can comprise a (very sweet) small meal, or be a pastry to go along with your coffee. They’re best warm, right out of the oven, when you break one open and on one end is the hot air rushing out, and on the other side a very smooth chocolate is running down the bread. For those interested, below we’ll continue with the story of our coming to the US. Here are parts 1, 2, 3. For those who are here just for the recipe, scroll all the way down. I started the 7th grade in the US and quickly got used to the school system. English came easy to me, as it did to most kids. Before six months were out, I completed all ESL (English as a Second Language) classes and was transferred to regular ones. The ESL program had the most understanding teachers, most of whom had travelled the world themselves. These teachers understood how different we were, and the kind of backgrounds we came from. 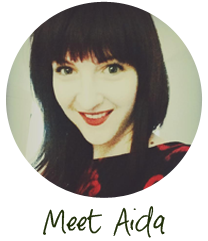 They also understood that we Balkan kids, in particular, were both too mature for our age having spent several years in war zones, and too naive having missed out on a real childhood. My favorite was Mrs. B., an elderly lady with curls comparable to Annie’s. She was waiting out the last couple of years of her career in the classroom. She had spent much of her life raising children and following her husband – an army general, Marlboro old school kind of guy – to strange lands called Ecuador and Bolivia. This exposed her to the way of life for us weird foreign kids. Now back on the US soil, she was our mother hen, the one who protected us from cruel curiosity of other teenagers, and gave us a safe place until we were ready to fly on our own. And fly away we did, into the first encounters with our new culture. The most surprising thing at the beginning was the level of optimism we encountered. The kind of optimism of the 90s US which in our countries would be considered bordering on delusional. Everyone would live past 100, everyone would be rich, and everyone would be happy. Americans defined the formula for good life like this: completion of high school and college. After college, there are a few years of independent living during which one buys their first condo. A couple of years into a serious relationship there comes the engagement. After one year’s engagement, there comes a wedding for show with at least 120 invites most of whom aren’t close friends. Next step, buying a dog to practice parenting. Soon thereafter, there comes a first single family dwelling followed by the kid number one. Then the move to a larger house and a kid number two. If the kids are not a boy and a girl, it’s the time for tryouts for the kid number three or four. Some short vacations, some stressful holidays, and somewhere in there a job one vaguely hates. Kids’ activities and several diets. Then getting the kids off to college. Moving to a smaller house. Retirement. Trip to wherever the family has roots in Europe to meet cousins. Kids getting married. Grandkids. Moving back into a condo. Many years passing. Then, maybe, death. A lot of living in the US was about the lists, and things to be done. And lists are fantastic for a lot of things. Completing a degree. Getting a house. Perfecting your swim. Learning the guitar. Signing up for the 401K. Organizing activities and responsibilities. But somehow these lists started getting applied to other areas of people’s lives. And this organization caused cracks in our system. We came from the place where where one buys a couch without measuring the room. Having to put coffee with friends “on a calendar” did not sit well. So we dealt differently with the cracks. A neighbor of ours, old man from Banja Luka started singing sevdalinka songs walking around the neighborhood. Some started drinking. Some returned home. What was clear in our small Balkan community was that men had a harder time with the move to the US than women did. It could be because our moms didn’t have time to think about whether they were accepted in the society, and started on the bottom and worked their way up. Or because women take crap easier. Or because they seemed harmless. Or for a million other reasons. But it so happened that for the first few years, our fathers were sinking, having lost the framework of what made them men. It was also harder being a refugee if you were an intellectual. At that point in the US, there was no use for people that meant something somewhere. Dad walked his CV to over 200 work places in the first couple of months and did not get one phone call back. He was jobless for close to a year, fueling the inception of his idea to return to his beloved Sarajevo, a decision which came to fruition a decade later. Because I want the story to be the story as it was. Thorns and all. Roses and all. Our parents were a different story. It was enough for my father to have a Muslim name – even though he was an atheist through and through his entire life – for people to mark him as questionable. Add to this his unusual hair, artistic mind, and a fantastic style that included a lot of pastels, and he was pretty much screwed from the start. All that in a country that prides itself on individualism. But one beautiful thing transpired in the Washington DC area, which was very unusual for Balkan people: the diaspora got along regardless of religion. For those not from the area, this is a huge feat. The Balkans is a peninsula where the largest preoccupation after the war has become counting who was on which side. To have these folks with similar names, similar backgrounds, similar tastes, get along (!) just as they should back home, was beautiful. Instead of dividing into groups, it was all about where to find a better job, which dentist to send the kids to for the braces, and where to finish up the taxes. Everyday things that Americans have brought to perfection. In this way, the unbridled American optimism got to us too. Combine yeast and sugar with a little bit of warm water and set aside for 10 minutes. In a bowl combine flour, salt, 2 eggs, yeast mix, and milk. 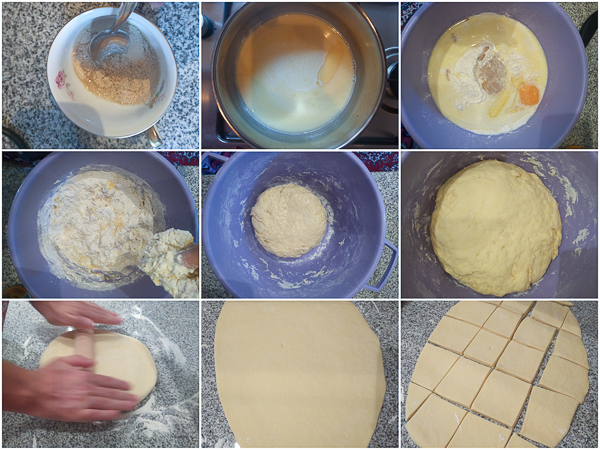 Work the ingredients with your hand (about 7-10 minutes) until you get a smooth and elastic ball of dough. Dab with oil and set aside for 45-60 minutes or until it doubles. Sprinkle your working area with flour and take the dough ball out. Work it with your hands (about 5 minutes), and start spreading it out with a rolling pin. When the dough is about the thickness of your forefinger, cut into 4-5 inch squares. (An easy way to do this is to cut stripes in one direction first, and then cut across.) 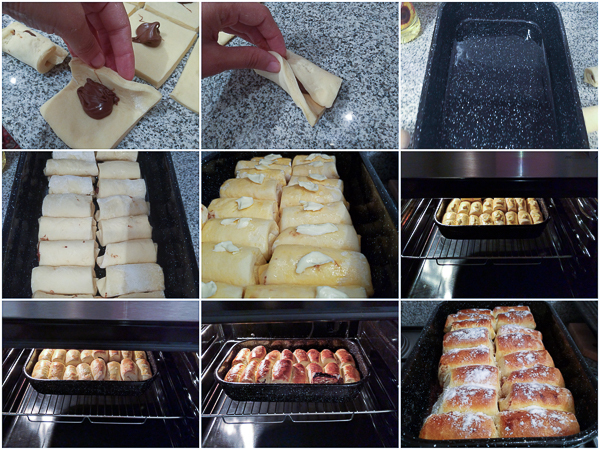 Put one tablespoon of Nutella in the middle of each dough square. Take one end of the square and “cover” Nutella with it. Then take the end and place on top of the first. This way you will get a little roll with Nutella on the inside. Repeat until you make rolls out of all squares. Oil a 9×13 inch (or similar) baking pan and place rolls inside making sure the “connected” side of each roll is on the bottom so it doesn’t open during baking. Mix the egg yolk until it’s smooth then paint each roll with it. Leave rolls aside for 30 minutes. Heat oven to 390F. Put one teaspoon of butter on each roll. Bake for 20-25 minutes, turning around the pan about halfway through. (Optional) Sprinkle with powdered sugar. You’ll get about 18-20 rolls this way, and serving size is about 2 per person.